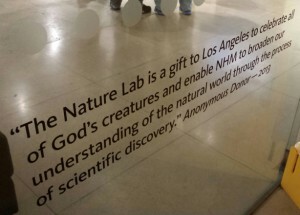 LOS ANGELES – Following criticism from an evolutionary biologist, the Natural History Museum of Los Angeles County has removed a quote from one of its displays that alluded to God as being the Creator. “[W]hy on earth did they have to mar [the exhibit] with this paean to a fictional being?” Coyne asked. The NHM also released a statement that reaffirmed the museum’s commitment to evolution. Although Coyne praised the removal of the quote as “a victory for secularism,” others were disappointed that the anonymous donor’s personal words were eradicated due to disapproval. In a blog post, the Discovery Institute said that the development raises concerns over ardent evolutionists censoring opposing viewpoints.